Unusual Presentation of Chondroblastoma with Management. Department Of Orthopaedics, Goa Medical College, Bambolim,Tiswadi –Goa 403202. India. Introduction: Chondroblastoma is a rare , benign tumor derived from chondroblasts, is almost exclusively an epiphyseal lesion, although it may secondarily extend into metaphysis. It is most commonly found in lower extremity with most common sites being distal femur followed by proximal femur, proximal humerus and proximal tibia. It is the purpose of the report to describe chondroblastoma in a seven year old child in the diaphyseal area of radius which is a rare entity & frequently presents as diagnostic dilemma. Case Report: The authors report a case of chondroblastoma involving the diaphyseal area of radius in a seven year old female child. 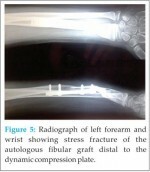 She presented with pain and swelling around the left distal third forearm for eight months . Wide excision of tumor was performed and the defect was bridged with avascular fibular auto graft , secured to host bone with k-wires and dynamic compression plate to achieve osteosynthesis. Conclusion: Pure metaphyseal and/or diaphyseal chondroblastomas are exceedingly rare. A presumptive diagnosis may be considered in the appropriate age group in the presence of chondroid matrix, perilesional edema, periosteal reaction, and marginal sclerosis. Regardless of all the diagnostic possibilities biopsy may still be required. However, knowledge of this entity will help make the final diagnosis and guide the correct treatment . Keywords: Chondroblastoma, diaphysis, radius, wide-excision. Chondroblastoma referred to as codman’s tumor, is a rare benign tumor derived from chondroblasts. It is found in epiphysis of long bones, usually before closure of physis of lower extremity . The tumor has a higher incidence in males than females (3:2) and the mean age of presentation is approximately 20years . The tumor presents in a child, teenager or young adult with pain and swelling around joint, usually, the shoulder, knee or around hip. Occasionally, tumor can occur in spine causing back pain. Less common location of tumors include bones of foot, scapula, patella, radius and fibula[1,2]. There can be functional impairment and growth disturbances as tumor is usually localized near a joint or growth place. There is also a high rate of recurrence. Metastasis of histologically benign chondroblastoma is rare . The suggested treatment for aggressive chondroblastoma ranges from simple curettage to wide resection with structural reconstruction . We present a case of chondroblastoma of diaphysis of radius in a seven year old female child which was treated with wide excision and autologous bone grafting with a good outcome at end of 2 year of follow up. The term benign ‘chondroblastoma’ was proposed by Jaffe and Lichtenstein  in 1942 to describe this rare benign, and distinctive tumor composed of immature chondroblasts with scanty chondroid matrix. The suffix ‘blastoma’ reflects a presumed relationship to primitive ‘blastic’ elements and dysontogenetic character[2,8] . Chondroblastoma represents 1% of all benign tumors . According to WHO 2002 definition, “Chondroblastoma is a benign , cartilage producing neoplasm usually arising in the epiphysis of skeletally immature patients.” Chondroblastomas usually arise from a secondary ossification center which is a unique location for primary bone tumors. Sixty percent of chondroblastomas cross the growth plate to extend into the metaphysis . Most of the reported cases of this uncommon tumor were between 10 to 17 years of age. Cases in which patient is less than 10 or more than 25 are uncommon (Jaffe,1957); our patient is a seven year old child. The four major series  of chondroblastoma include 258 cases of which only five were in metaphysis of long bones. Two other metaphyseal lesions were recorded in smaller group of chondroblastomas reported by Sherman and Uzel ; and by Salzer and associates. The bones often involved by epiphyseal chondroblastomas are femur, tibia and humerus. Therefore, except for humerus, the distribution of metaphyseal tumors roughly parallels commonest location of epiphyseal chondroblastomas . Chondroblastoma in growing children is most frequently located in proximal part of tibia and proximal femoral epiphysis .The radiographic appearance is usually suggestive of the diagnosis. The lesion is usually seen as an oval intramedullary tumour with distinct margins. 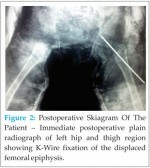 A key diagnostic feature is its almost invariable location within an epiphysis or an apophysis. Other common features are expansion, sclerotic rim, and matrix calcification. Penetration through the cortex into the soft tissues is seen only in a small percentage of cases . Chondroblastoma is generally benign, shows slow pattern of growth with well-defined margins, but its clinical outcomes are unpredictable as aggressive behavior with local recurrence and lung metastasis have been reported . Functional outcomes of surgical treatment of chondroblastoma are generally good, provided the tumor is not discovered very late and that the tumor does not recur. The risk of recurrence appears to be highest for lesions located only in the epiphysis, as opposed to lesions in the apophysis or those that extend into the metaphysis or diaphysis. The recurrence rate ranges from 10% to 35% after curettage and reconstruction with bone graft or polymethylmethaacrylate cement . Factors contributing to recurrence are debatable among studies; more recent reports include: young age, aneurysmal bone cyst components, aggressiveness, anatomic site and inadequate surgery . This case is being reported because of its unusual age of presentation in a female child in the diaphysis of radius. Good functional outcome can be obtained by wide excision and autologous avascular fibular grafting. However it is prudent to immobilize these patients till there is consolidation and incorporation of graft to prevent stress fractures especially when plate fixation is being used. 1. Unni K. Dahlin’s Bone Tumors. Lippincott-Raven Publishers, 1996; 45-59. 2. Sotelo-Avila C, Sundaram M, Kyriakos M, et al. Case report 373: Diametaphyseal chondroblastoma of the upper portion of the left femur. Skeletal Radiology 1986;15:387. 3. Ilaslan H, Sundaram M, Unni KK. Vertebral chondroblastoma. Skeletal Radiology.2003;32:66–71. 4. Caterini R, Manili M, Spinelli M. Epiphyseal chondroblastoma of bone : long-term effects on skeletal growth and articular function in 15 cases treated surgically. Arch Orthop Trauma Surg 1992 ; 111 : 327-331. 5. Dorfman HD, Czerniak B. BoneTumors. St Louis: C.V. Mosby,1998;296-321. 6. Riddell RJ, Louis CJ, Bromberger NA. Pulmonary metastases from chondroblastoma of the tibia : report of a case, J Bone Joint Surg 1973 ; 55-B : 848-853.
the so called calcifying or chondromatous Giant cell tumor. American Journal of Pathology.1942; 18:969-971. 8.Brandwein M, Al Naeif NS, Manwani D, et al. Sialoblastoma: clinicopathological/immunohistochemical study. Am J Surg Pathol. 1999;23:342–8. 9 . Masui F, Ushigome S, Kamitani K, Asanuma K, Fujii K. Chondroblastoma: a study of 11 cases. Eur J Surg Oncol. 2002;28:869–74. 10. Schazowicz, Fritz, and Gallardo Hector: Epiphyseal Chondroblastoma of Bone. A Clinico-pathological Study of Sixty-nine Cases. J. Bone and Joint Surg., 1970;52-B: 205-226. 11. Sherman, R. S. , and Uzel, A. R. : Benign Chondroblastoma of Bone. Its Roentgenolical Diagnosis. Am. J. Roentgenol.,1956; 76: 1132-1140. 12. Dahlin, D. C., and Ivins , J. C.: BenignChondroblastoma. A Study of 125 Cases. Cancer, 1972; 30: 401-413. 13. Ramappa AJ, Lee FY, Tang P, Carlson JR, Gebhardt MC, Mankin HJ. Chondroblastoma of bone. J Bone Joint Surg Am. 2000;82-A:1140–5. 14. Jain M, Kaur M, Kapoor S, Arora DS. Cytological features of chondroblastoma: a case report with review of the literature. Diagn Cytopathol. 2000;23:348–50. 15. Sailhan F, Chotel F,Parot R: Chondromablastoma of bone in paedriatric population. J Bone Joint Surg Am. 2009 Sep; 91(9):2159-68. 16. Nagai M, minami A: Recurrent benign chondroblastoma at distal end of radius. J Hand surgery 1999;24-B: 113-115. 17.Garin IE, Wang EH: Chondroblastoma. 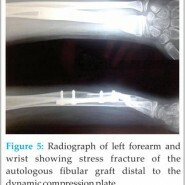 J ortho op surg (Hongkong)2008;16:84-7. 18.Huvos, Andrew; Bone Tumors: Diagnosis, Treatment and Prognosis, W.B.